Area (including Bijagos Archipelago): 36,125 sq. km., about the size of Maryland. Cities: Capital: Bissau. Other cities — Bafata, Gabu, Canchungo, Farim, Cacheu. Regions: Oio, Tombali, Cacheu, Bolama, Quinara, Biombo, Bafata, Gabu. Terrain: Coastal plain; savanna in the east. Nationality: Noun and adjective — Bissau-Guinean(s). 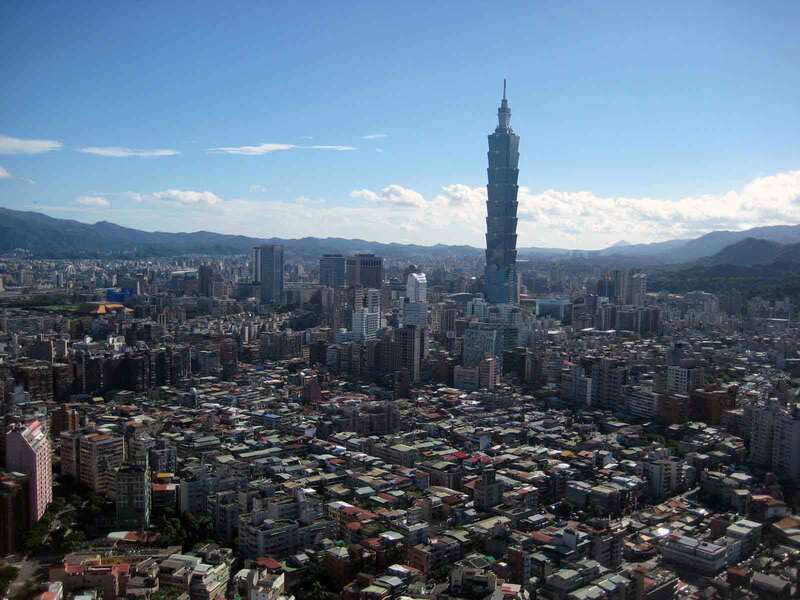 Population (July 2010): 1.645 million. Population growth rate (2009): 2%. Ethnic groups: Balanta 30%, Fula 20%, Manjaca 14%, Mandinga 13%, Papel 7%, others 16%. Religions: Indigenous beliefs 50%, Muslim 40%, Christian 10%. Languages: Portuguese (official), Creole, French; many indigenous languages — Balanta-Kentohe 26%, Pulaar 18%, Mandjak 12%, Mandinka 11%, Pepel 9%, Biafada 3%, Mancanha 3%, Bidyogo 2%, Ejamat 2%, Mansoanka 1%, Bainoukgunyuno 1%, Nalu 1%, Soninke 1%, Badjara 1%, Bayote 0.5%, Kobiana 0.04%, Cassanga 0.04%, Basary 0.03%. Education: Years compulsory: 4. Literacy (2008) — 42.4% of adults. Health: Infant mortality rate (2009): 99.82 deaths/1,000 live births. Life expectancy (2009) — 47.9 years. Work force (2007): 632,700. Agriculture — 82%; industry, services, and commerce — 13%; government — 2%. Type: Republic, multi-party since 1991. Independence: September 24, 1973 (proclaimed unilaterally); September 10, 1974 (de jure from Portugal). Constitution: Adopted 1984. The National Assembly adopted a new constitution in 2001, but it was neither promulgated nor vetoed by the President. Branches: Executive: president (chief of state), prime minister (head of government) and Council of State, ministers and secretaries of state. Legislature — National Popular Assembly (ANP), 100 members directly elected in 2008. Judicial — Supreme Court and lower courts. Administrative subdivisions: Autonomous sector of Bissau and eight regions. Political parties: In the November 2008 parliamentary elections, the African Party for the Independence of Guinea-Bissau and Cape Verde (PAIGC) won 67 seats; the Social Renovation Party (PRS) won 28 seats; and the Republican Party for Independence and Development won 3 seats. In addition to these three major parties, there are numerous other political parties. Annual growth rate (2009): 3%. GDP per capita (2010): $509. Natural resources: Fish and timber. Bauxite and phosphate deposits are not exploited; offshore petroleum. Agriculture (62% of GDP): Products: cashews, tropical fruits, rice, peanuts, cotton, palm oil. Arable land — 11%. Forested — 38%. Industry (12% of GDP): Cashew processing. Very little industrial capacity remains following the 1998 internal conflict. Trade (2009): Exports: $114.8 million: cashews ($110.1 million); fish; shrimp; peanuts; palm kernels; sawn lumber. Major markets (2008) — India 56.8%, Nigeria 35.6%, Pakistan 1.2%. Imports — $146.4 million: food products ($58.1 million), petroleum products ($35 million). Major suppliers (2008) — Portugal 24.5%, Senegal 17.2%, Pakistan 4.8%, France 4.6%. 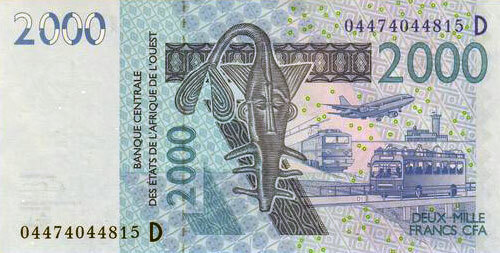 Currency: West African franc (CFAF): 516 CFAF = U.S. $1 (January 11, 2012). The population of Guinea-Bissau is ethnically diverse with distinct languages, customs, and social structures. Most people are farmers, with traditional religious beliefs (animism); 40% are Muslim, principally Fula and Mandinka speakers concentrated in the north and northeast. Other important groups are the Balanta and Papel, living in the southern coastal regions, and the Manjaco and Mancanha, occupying the central and northern coastal areas. According to the 2009 census, 42.5% of the population is under 15 years of age; 3.2% is 65 and older, and 49.6% are women aged between 15 and 49. The country has 1,361 schools and 537 health centers. The rivers of Guinea and the islands of Cape Verde were among the first areas in Africa explored by the Portuguese in the 15th century. Portugal claimed Portuguese Guinea in 1446, but few trading posts were established before 1600. In 1630, a "captaincy-general" of Portuguese Guinea was established to administer the territory. With the cooperation of some local tribes, the Portuguese entered the slave trade and exported large numbers of Africans to the Western Hemisphere via the Cape Verde Islands. Cacheu became one of the major slave centers, and a small fort still stands in the town. The slave trade declined in the 19th century, and Bissau, originally founded as a military and slave-trading center in 1765, grew to become the major commercial center. Portuguese conquest and consolidation of the interior did not begin until the latter half of the 19th century. Portugal lost part of Guinea to French West Africa, including the center of earlier Portuguese commercial interest, the Casamance River region. A dispute with Great Britain over the island of Bolama was settled in Portugal's favor with the involvement of U.S. President Ulysses S. Grant. Before World War I, Portuguese forces, with some assistance from the Muslim population, subdued animist tribes and eventually established the territory's borders. The interior of Portuguese Guinea was brought under control after more than 30 years of fighting; final subjugation of the Bijagos Islands did not occur until 1936. The administrative capital was moved from Bolama to Bissau in 1941, and in 1952, by constitutional amendment, the colony of Portuguese Guinea became an overseas province of Portugal. In 1956, Amilcar Cabral and Raphael Barbosa organized the African Party for the Independence of Guinea and Cape Verde (PAIGC) clandestinely. The PAIGC moved its headquarters to Conakry, Guinea, in 1960 and started an armed rebellion against the Portuguese in 1961. Despite the presence of Portuguese troops, which grew to more than 35,000, the PAIGC steadily expanded its influence until, by 1968, it controlled most of the country. It established civilian rule in the territory under its control and held elections for a National Assembly. Portuguese forces and civilians increasingly were confined to their garrisons and larger towns. The Portuguese Governor and Commander in Chief from 1968 to 1973, Gen. Antonio de Spinola, returned to Portugal and led the movement that brought democracy to Portugal and independence for its colonies. Amilcar Cabral was assassinated in Conakry in 1973, and party leadership fell to Aristides Pereira, who later became the first president of the Republic of Cape Verde. The PAIGC National Assembly met at Boe in the southeastern region and declared the independence of Guinea-Bissau on September 24, 1973. 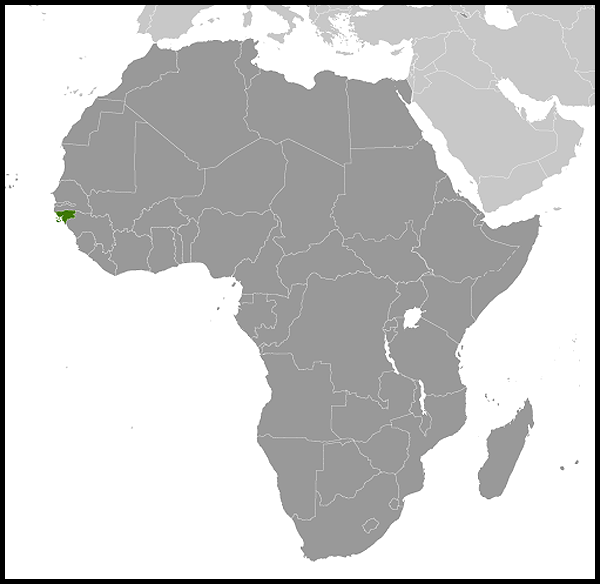 Following Portugal's April 1974 revolution, it granted independence to Guinea-Bissau on September 10, 1974. The United States recognized the new nation that day. Luis Cabral, Amilcar Cabral's half-brother, became president of Guinea-Bissau. In late 1980, the government was overthrown in a relatively bloodless coup led by Prime Minister and former armed forces commander Joao Bernardo "Nino" Vieira. From November 1980 to May 1984, power was held by a provisional government responsible to a Revolutionary Council headed by President Joao Bernardo Vieira. In 1984, the council was dissolved, and the National Popular Assembly (ANP) was reconstituted. The single-party assembly approved a new constitution, elected President Vieira to a new 5-year term, and elected a Council of State, which was the executive agent of the ANP. Under this system, the president presided over the Council of State and served as head of state and government. The president also was head of the PAIGC and commander in chief of the armed forces. There were alleged coup plots against the Vieira government in 1983, 1985, and 1993. In 1986, first Vice President Paulo Correia and five others were executed for treason following a lengthy trial. In 1994, the country's first multi-party legislative and presidential elections were held. An army uprising against the Vieira government in June 1998 triggered a bloody civil war that created hundreds of thousands of displaced persons and resulted in President Vieira having to request assistance from the governments of Senegal and Guinea, who provided troops to quell the uprising. The President was ousted by a military junta in May 1999. An interim government turned over power in February 2000 when opposition leader Kumba Yala, founder of the Social Renovation Party (PRS), took office following two rounds of transparent presidential elections. Despite the elections, democracy did not take root in the succeeding 3 years. President Yala neither vetoed nor promulgated the new constitution that was approved by the National Assembly in April 2001. The resulting ambiguity undermined the rule of law. Impulsive presidential interventions in ministerial operations hampered effective governance. On November 14, 2002, the President dismissed the government of Prime Minister Alamara Nhasse, dissolved the National Assembly, and called for legislative elections. Two days later, he appointed Prime Minister Mario Pires to lead a caretaker government controlled by presidential decree. Elections for the National Assembly were scheduled for April 2003, but later postponed until June and then October. On September 12, 2003, the President of the National Elections Commission announced that it would be impossible to hold the elections on October 12, 2003, as scheduled. The army, led by Chief of Defense General Verrisimo Correia Seabra, intervened on September 14, 2003. President Yala announced his "voluntary" resignation and was placed under house arrest. The government was dissolved and a 25-member Committee for Restoration of Democracy and Constitutional Order was established. On September 28, 2003, businessman Henrique Rosa was sworn in as President. He had the support of most political parties and of civil society. Artur Sanha, PRS President, was sworn in as Prime Minister. On March 28 and 30, 2004, Guinea-Bissau held legislative elections which international observers deemed acceptably free and fair. On May 9, 2004, Carlos Gomes Junior became Prime Minister. On August 10, 2005 Joao Bernardo Vieira was declared the winner of a July 24 presidential runoff election over Malam Bacai Sanha in an election judged by international observers to be free and fair. President Vieira was inaugurated on October 1, 2005. Prime Minister Carlos Gomes Junior refused to accept Vieira's victory, and on October 28, Vieira dismissed Gomes and his government. Five days later, he installed former PAIGC official Aristide Gomes as Prime Minister. Throughout 2006, President Vieira struggled to maintain control over the National Assembly and the general operations of the government. In early March 2007, the three main political parties — the PAIGC, the PRS, and the PUSD — agreed to push for a "government of consensus" in the interests of parliamentary stability. President Vieira refused to accept the decision, and on March 19 the National Popular Assembly passed a vote of no confidence against Prime Minister Aristide Gomes. President Vieira was then faced with the decision of dissolving the government and calling for new elections or appointing a new prime minister. Prime Minister Gomes resigned on March 29. In early April 2007, after much resistance, President Vieira accepted the appointment of Martinho Ndafa Cabi as the new Prime Minister. In February 2008, the PAIGC withdrew support of Prime Minister Martinho Ndafa Cabi, and the March legislative elections were postponed. By July, the PAIGC pulled out of the political "government of consensus" coalition days before the Supreme Court ruled that the extension of parliament's mandate was unconstitutional, thus triggering President Vieira to dissolve parliament and remove Prime Minister Cabi. President Vieira appointed Carlos Correia as new prime minister. On November 16, 2008 Guinea-Bissau held successful legislative elections that were praised by the international community as well-organized and transparent. PAIGC won the majority of seats in the National Assembly. Carlos Gomes Junior was appointed prime minister. The new parliament has called for a fight against drug trafficking. This is especially important given the recent increase in news media reports examining Guinea-Bissau's role in the West African regional drug trade. On March 1, 2009 Armed Forces General Batista Tagme Na Wai was killed in a bomb blast at the military headquarters. The following morning President Vieira was killed by a group of soldiers at the presidential palace. National Assembly Speaker Raimundo Pereira — the constitutionally-designated interim president — took the oath of office on March 3 during a special session of parliament. As a result of the June 28 presidential election and the July 26 runoff, former interim president Malam Bacai Sanha defeated former president Kumba Yala and assumed office on September 8, 2009. In concert with support from the international community, the United States contributed $300,000 toward these elections, which were judged to be free, fair, and without incident or notable tension. On April 1, 2010, ex-Navy Chief of Staff Bubo Na Tchuto left the UN premises in Bissau, where he had sought refuge in late December 2009 after deserting the military and going into exile in The Gambia in 2008. He was accompanied on April 1 by troops loyal to Deputy Defense Chief of Staff Antonio Indjai, who then arrested and detained Defense Chief of Staff Jose Zamora Induta and Prime Minister Carlos Gomes. (The latter was released after vigorous public and international protests.) The United States condemned the kidnappings and violence, and called for release of those illegally detained and for a return to constitutional order. On April 8, the United States listed Na Tchuto and his associate, Ibraima "Papa" Camara, as narcotics trafficking kingpins for the purposes of freezing their assets, banning their travel, and precluding Americans from doing business with them. These existing conditions, compounded by the Government of Guinea-Bissau's June 30 appointment of Indjai as the new chief of staff and the subsequent reappointment of Na Tchuto to his former position, led to decisions by the United States to suspend most military assistance and by the European Union to terminate by September 30, 2010, its mission for the reform of Guinea-Bissau's security forces. On May 6, 2011, Lucinda Ahukarie, chief of one of the country's most credible law enforcement institutions, resigned over concern about the military's threats to her agency's fight against narcotrafficking. On June 6, 2011, the National Assembly overwhelmingly adopted a law against female genital mutilation (FGM), which will allow penalties of up to 5 years in prison for perpetrators of FGM. After being hospitalized since November 2011 in Paris, President Sanha died on January 9, 2012. By law, National Assembly Speaker Raimundo Pereira became acting president and must arrange new elections, which in principle will occur in 60-90 days. Sanha's death comes on the heels of a December 26 military power struggle and ostensible coup attempt, which resulted in an attack on Army/Armed Forces Chief of Staff Indjai by military troops and civilians loyal to Navy Chief Na Tchuto. The government and military subsequently have arrested and detained Na Tchuto and his supporters. Guinea-Bissau is among the world's least developed nations and depends mainly on agriculture and fishing. Guinea-Bissau exports some fish and seafood, although most fishing in Guinea-Bissau's waters is presently not done by Bissau-Guineans and no fish or seafood is processed in Guinea-Bissau for export. The country's most important product is cashews. License fees for fishing provide the government with some revenue. Rice is a major crop and staple food and, if developed, Guinea-Bissau could potentially be self-sufficient in rice. Tropical fruits such as mangos could also provide more income to the country if the sector were developed. Because of high costs, the development of petroleum, phosphate, and other mineral resources is not a near-term prospect. However, unexploited offshore oil reserves may possibly provide much-needed revenue in the long run. The military conflict that took place in Guinea-Bissau from June 1998 to early 1999 caused severe damage to the country's infrastructure and widely disrupted economic activity. Agricultural production is estimated to have fallen by 17% during the conflict, and the civil war led to a 28% overall drop in gross domestic product (GDP) in 1998. In 2009 Guinea-Bissau made progress stabilizing its economy. Economic growth was low at 3%, reflecting political instability and an unfavorable external environment, but inflation slowed and budgetary stability was regained. The global financial crisis in 2009 resulted in lower prices for cashews, the major cash crop. Fiscal performance was satisfactory. Annual inflation averaged 1.0% in 2009, an improvement from the 10.4% in 2008. This dramatic drop was caused by lower food and fuel prices. In 2009, the external current account deficit (excluding grants) widened to 6.5% of GDP. This higher deficit reflected a combination of lower cashew prices, a surge in imports of oil and construction material, and a decline in remittances. Total revenue in 2009 (excluding grants) increased by more than 16.4%, 2.4% more than forecast. Agriculture accounts for over 60% of GDP, employs over 80% of the labor force, and comprises about 90% of exports. In May 2010, the IMF Executive Board approved a 3-year Extended Credit Facility (ECF) arrangement of $33.3 million to support Guinea-Bissau's medium-term economic program. An International Monetary Fund (IMF) mission visited Guinea-Bissau in September 2010. Guinea-Bissau reached the Heavily Indebted Poor Countries (HIPC) Initiative completion point in December 2010. Tax revenues exceeded predictions by 2% of GDP, reflecting a good cashew harvest. The government contained spending and kept domestic arrears on target. On May 10, 2011, the Paris Club of creditors canceled $283 million in debt owed by the Government of Guinea-Bissau; the United States was not a creditor. Guinea-Bissau joined the West African Economic and Monetary Union (WAEMU) in 1997, and has made efforts to harmonize its policies with the standards of the WAEMU, including a switch to a single value-added tax (VAT) rate. The Government of Guinea-Bissau's priority has been to solicit bilateral donations to cover immediate operational expenditures such as payment of salaries. Although fiscal transparency has improved, the Court of Accounting lacks funding and the necessary independence to effectively audit the government's budget and expenditures. The country is open to foreign private investment, but infrastructure and political instability are significant disincentives to potential investors. Operating a business in Guinea-Bissau has been challenging; in the 2010 World Bank's "Doing Business" survey, the country ranked last out of 183 economies for starting a business. In response, the government's new Business Formation Center has reduced the time it takes to register a business from 216 days to just 1 day. Private investment is subject to complex administrative regulations, although the government often is unable to enforce them. On June 8, 2011, Houston-based Noble Energy announced it had joined a venture to explore for oil and gas 65 miles off the coast of Senegal and Guinea-Bissau beginning in summer 2011. The Kora prospect may hold up to 450 million barrels of oil. Guinea-Bissau follows a nonaligned foreign policy and seeks friendly and cooperative relations with a wide variety of states and organizations. Angola, Cuba, the European Union, France, The Gambia, Portugal, Brazil, Mauritania, Nigeria, People's Republic of China, Libya, Senegal, Spain, Guinea, and Russia have embassies in Bissau. Belgium, Canada, Germany, the Netherlands, Italy, Sweden, Switzerland, the United Kingdom, and the U.S. conduct diplomatic relations with Guinea-Bissau through their embassies in neighboring Dakar, Senegal. Guinea-Bissau is a member of the UN and many of its specialized and related agencies. It is a member of the World Bank and the International Monetary Fund (IMF); African Development Bank (AFDB), Economic Community of West African States (ECOWAS), West African Economic and Monetary Union (WAEMU), Organization of Islamic Cooperation (OIC), African Union, and permanent Interstate Committee for drought control in the Sahel (CILSS). Guinea-Bissau also is a member of the Group of 77 (G-77), International Civil Aviation Organization (ICAO), Food and Agriculture Organization (FAO), and World Health Organization (WHO). The U.S. Embassy suspended operations in Bissau on June 14, 1998, in the midst of violent conflict between forces loyal to then-President Vieira and the military-led junta. Prior to and following this action, the United States and Guinea-Bissau have enjoyed very good bilateral relations. 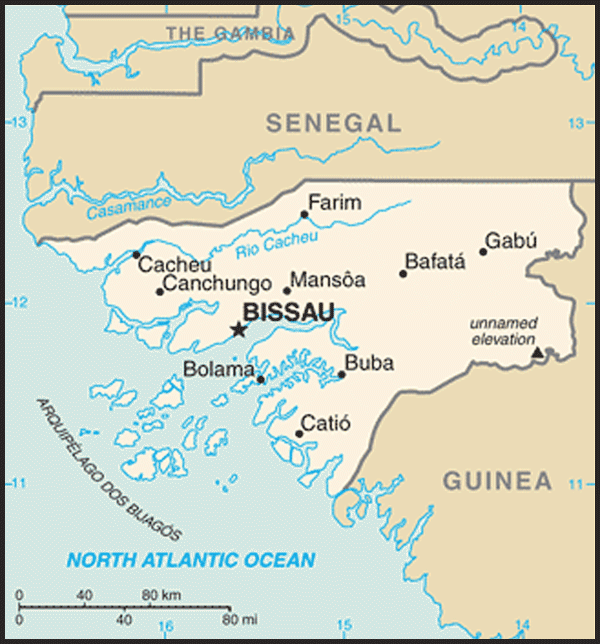 The U.S. recognized the independence of Guinea-Bissau on September 10, 1974. Guinea-Bissau's Ambassador to the United States and the United Nations was one of the first the new nation sent abroad. The United States opened an Embassy in Bissau in 1976, and the first U.S. Ambassador presented credentials later that year. U.S. assistance began in 1975 with a $1 million grant to the UN High Commissioner for Refugees for resettlement of refugees returning to Guinea-Bissau and for 25 training grants at African technical schools for Guinean students. Emergency food was a major element in U.S. assistance to Guinea-Bissau in the first years after independence. Since 1975, the U.S. has provided more than $65 million in grant aid and other assistance. After the 1998 war the United States provided over $800,000 for humanitarian demining to a non-governmental organization (NGO) which removed over 2,500 mines and 11,000 unexploded ordnance from the city of Bissau;. The United States currently is providing $20 million in food aid (primarily in school feeding programs for almost half of Guinea-Bissau's children); $3 million for assisting refugees, supporting the cashew industry, and promoting democracy; $1.6 million for judicial reform and rule of law programs; and $1 million for demining and disposal of unexploded ordnance. The United States suspended over $120,000 in annual International Military Education and Training (IMET) funding and other military cooperation as a result of the April 1, 2010 mutiny by the Bissau-Guinean military leadership. The Peace Corps withdrew from Guinea-Bissau in 1998 at the start of the civil war. In March 2007, the U.S. and Brazil signed a Tripartite Memorandum of Understanding with Guinea-Bissau highlighting a parliamentary strengthening project first implemented in 2005. In November 2008, the two countries also announced a Biofuels Partnership with Guinea-Bissau. In 2010, the United States exported $4.33 million in mostly agricultureal products,electronics, machinery, transportation equipment to Guinea-Bissau. Some $885,000 in imports consisted of predominantly minerals and metals. Guinea-Bissau has not had much success in attracting foreign investment and has not yet taken advantage of its African Growth and Opportunity Act (AGOA) membership to increase exports to the United States. AGOA eligibility remains an important symbol of U.S. engagement with this post-conflict state, and offers an incentive to encourage the government to enact market enhancements, continue security sector reform and economic development in key sectors, and institutionalize democratic advances. There is no U.S. Embassy in Bissau. The U.S. Ambassador to Senegal, who resides in Dakar, is accredited as the U.S. Ambassador to Guinea-Bissau. All official U.S. contact with Guinea-Bissau is handled by the U.S. Embassy in Dakar, Senegal (http://dakar.usembassy.gov/). Local employees staff the U.S. Office in Bissau, and American diplomats from the Embassy in Dakar travel frequently to Bissau to conduct normal diplomatic relations.